“Soul Mates“, the very term conjures up images of a relationship so deep and comfortable that one blissfully sinks into it without a care or thought toward any distractions to their partner or from their partner. Often these daydreams include visions of our idea of the most physically attractive partner we can imagine paired with a mind always in agreement with our own and seeking nothing for itself. Of course, one wakes from these daydreams and distractions eventually and realizes the truth is much closer to home. For me it was my grandparents who despite their advanced years remained very much actively in love, playful with each other, very physically affectionate, and while capable of vehement disagreements they were capable of having them without anger or malice of any kind towards each other. They also regularly finished each others sentences and when queried by a third party they often responded in unison. I remember that each had the uncanny ability to predict exactly what the other would say when asked a specific question – but this never stopped them from communicating. Their interests diverged dramatically in many respects with his being favorites in things like flying, woodworking, and mechanics. Hers lay in travel, art, and culinary exploration. Rather than their diversity being a source of derisiveness, having such divergent interests allowed them to better complement each other. They had married very young by today’s standards, and had been married for well over 50 years. I remember one seminal moment when the doctor came to see my grandfather when he and my grandmother were both in the hospital. My grandmother had been at home, sleepless with worry (as my grandfather had had a recent bout with Lupus) and busying herself with cooking for family and watching the Travel Channel as she plotted whether or not there was yet another place she needed to see in person. She had a favorite stool at her kitchen’s island and it was old and worn. She fell asleep on the stool and suddenly fell sideways breaking her hip. She had been suffering from heart problems making it necessary for them to wait a few days for the replacement surgery and as she did her health seemed to deteriorate quickly. She too soon had caught an infection and the fever set in. The surgery never happened and she became bedridden – home care was arranged but she seemed to wilt as she realized her life would never be the same. My grandfather aided by family watched over and cared for her – but eventually she needed in-patient care to stabilize her and she was transferred to the hospital. About the same time, and though my grandfather had been quite healthy and vigorous, a small wound on his foot had become infected, the infection reached the bone, and a partial amputation followed. Soon a systemic infection set in and this burly and powerful man was laid low by the smallest of creation’s creatures and they were in the hospital together in separate rooms on separate floors. I was visiting him one day when the doctor came in and told him that he had finally turned the corner and if things continued he would be going home the next week. He immediately brightened up, and told the doctor how good it would be to be back at home with his wife. The doctor paused, and carefully explained that he would be going home – his wife was another matter and that he should expect that she would never go home again. Her prognosis was very grim, and with that, his dreams of being back at home with her again were dashed like a crystal vase on a tile floor. I saw it in his eyes and face. It was like the emotion drained out of him. His eyes which once sparkled and glittered now dimmed and dulled, his expression became solemn and lifeless, and he seemed smaller and suddenly weak. In addition, because of his prior infection and her weakened state he would be not be permitted to see her in person or be in the same room, much less have any form of physical contact. He nodded to the doctor, and without saying a word lay back in the bed and closed his eyes. He almost whispered, “I’m so tired, and I just can’t face going home without her…”. A tear rolled down the cheek of the one man I had never seen cry. He refused food and drink. The next night he passed away quietly and wordlessly, as if to use silence to say “there is nothing more to be said”. I never saw him alive again. There was great consternation about whether or not to tell my grandmother what had happened. The fever had taken her for days at a time and her lucidity came and went like a flickering porch lamp. Often when she was lucid it didn’t last long enough to impart any useful information, as she often didn’t know where or when she was. A few days after he died though, I had come in from a work trip to see her. They had warned me she was slipping away, and it had been a rush to beat the reaper so that we could say our goodbyes. I was awash in emotion and trying very hard to hold it together, but when I walked in she was alert and sitting up and talking up a storm. As soon as I walked in the door she blurted out to me “He’s dead you know. He’s gone. He left without me. Oh it’s so good to see you!”. We had a lovely conversation during which I told her about work and her great-grandchild, and got to laugh and cry together. It wasn’t to last, as the day wore on she started to fade. She knew she couldn’t go home and kept repeating “He’s gone, and I miss him so much. I just want to be with him again… even if for a short time, I forgot to tell him I’ll always love him…” throughout the evening. She asked me to hold her hand because she was scared,and Grampa wasn’t there to do it. I did, I sat by her bed and held her hand for the next few hours and the family piled into her room and the children played, the adults argued about inane trivia, and we all watched a TV game show she had been following. At some point I noticed that she no longer had a pulse. She still had my hand tightly gripped when she passed away, with wisp of a smile on her face. They died within a week of each other and Thanksgiving is always tinged with sadness at their loss and thankfulness for the mercy that they were able to not only live together but die together, so that she was not subjected to the loneliness and despair that his loss caused her any longer than was necessary. They were soul mates. Their shining example of a harmonious marriage built on a foundation of service to each other, mutual love and affection, and an abundance of joy made a lasting imprint on me. When she met the woman who would later become my wife, her primary concern was that she would not be fully aware of the task of caring for a husband in the manner of the example I had been raised to expect. 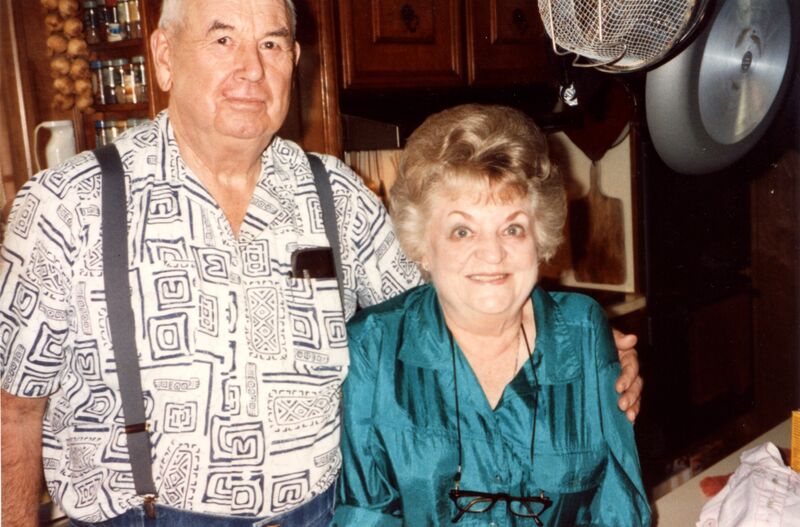 They both spent endless hours as I grew up imparting wisdom and instructions on how to care for your partner and maintain a happy and balanced marriage. She did the same for my fiancee, both before and after the marriage. At one point she provided my wife a recipe box containing my favorite foods to help her in caring for me as the military was about to take my new family far from home. Her only criteria for a good spouse was that they were also my best friend and that they truly love me and care for me, so that she could one day leave this world confident that I was in good hands. She abhorred divorce as the child of a broken home, and often reiterated that “we make ourselves happy. Your husband or wife simply shares the joy you create.” It was her greatest hope that I would find my soulmate, but she also insisted that soulmates were made and not found, and that developing a marriage to that point would take more years than she would live to see. I know for a fact, that they are both very proud and happy for what we found together and then built upon over the intervening years. By growing together instead of apart through joy and adversity, we, too, have become Soulmates. Please feel free to share your thoughts or stories in the comments section, as always I appreciate your feedback and comments, tweets, likes, and reposts. You can email me at cc70458@gmail.com if you’d like to pass anything on. ← Whats in a Ring? Just came here from the link on Shea. Very impressed with what I’ve been reading. Keep up the good work! Plus, this was a wonderfully touching story about your grandparents. A thought I’ve had about soulmates is that the modern romantic notion of “finding them”, as if they were born to be our soulmate, is inaccurate. In reality, when we get married we have the opportunity to become soulmates with our spouse, whoever they are. This is true of every marriage, from an arranged marriage to two people who fell in love at first sight. Doing the sort of things you’ve advised in your posts so far is how we become soulmates. It’s through each spouse opening our soul and letting the other in, until our souls become one. It’s how an arranged marriage can grow from ignorance of one another to blissful love. It’s how two people who fell in love at first sight can maintain that closeness instead of later asking why it all fell apart. We totally agree, Ken! You don’t just magically find the right person and live happily ever after. While there is something to finding someone you just want to spend the rest of your life with, (we might call this chemistry) this kind of relationship doesn’t just happen. It’s built by two people committed to working toward it. Trust, sharing all, letting down the defensive walls, trying to leave selfishness behind and put the other person first… we’ve had our hard times and our moments where we failed to work as a team. There were even points where I wondered if we would make it. But neither of us gave up. And for the at least the last 10 – 12 years, I can only say it has gotten better and better. Entering the Church as a family in 2005 shed a whole new light on our relationship and how we could make things better still, as well. One thing we’ve both found important is an underlying, intimate friendship. There is nothing I feel I cannot confide to my husband. He *is* my best friend. And having that as a foundation, I wouldn’t want to do anything to betray his trust in me, either. Bless you. Thank you for sharing these things. You are an inspired man and your knowledge of The Lord is strong. I can sense the kindness and the earnestness in your writings, and you have uplifted me with these things. Thanks for sharing this very touching insight into your wonderful relationship with your grandparents and their true devotion to their each other. Glad you joined the “Share Your WordPress Blogs”. I look forward to reading more of your blogs. Such a beautiful story… Thank you for sharing it. Together they lived as everyday saints, and in the story of their deaths they inspire all married people to a higher calling. If we can not love each other totally how can we love ourselves, our children or our God. I hope they pray for me and my family before the face of God in heaven where they enjoy everlasting life and love.